Samantha Kingston has it all: the world’s most crush-worthy boyfriend, three amazing best friends, and first pick of everything at Thomas Jefferson Highâ€”from the best table in the cafeteria to the choicest parking spot. Friday, February 12, should be just another day in her charmed life. Then she gets a second chance. Seven chances, in fact. Reliving her last day during one miraculous week, she will untangle the mystery surrounding her death and discover the true value of everything she is in danger of losing. Amazing, awesome, excellent are all words I would use to describe the book, Before I Fall. I absolutely LOVED it! I was engrossed right from the beginning and read this book in a Â matter of a couple of days. The story was fast paced and not all boring. When I first read the back of the book, I thought oh this sounds a bit like the movie Groundhog Day where the person lives the same day over and over again. I didn’t like the movie and my hopes weren’t high for the book. Boy, was I wrong! The main character Samantha Kingston is part of the popular crowd in school. She and her friends rule the school. They have the attitude that they are better than everyone else and actually go out of their way to mean to their peers. As I was reading, I was horrified by how mean these girls were especially Sam’s best friend, Lindsay. I was disgusted how cruel the girls were and felt sorry for their victims. Yet, another reason I am glad that I am out of high school although I think these girls were meaner than any girls in my high school! The author made these characters so real for me that I was actually feeling really emotional when I was reading! I thought it was funny how the author described Sam’s boyfriend, Rob. He’s the popular guy in school that everyone wants to date. We learn though that appearances are deceiving and this guy is actually a bad kisser, not very romantic, etc etc. I had a chuckle about the way Sam thinks of him and it proves you can’t judge a book by its cover. In the book, Sam lives the same day over and over. Each day is the same, but different. 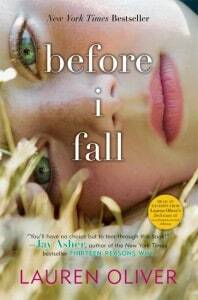 She tries to fix the mistakes she made and make things right and you can see her slow transformation as the book progresses into a girl that is nice and cares about people. However, I do want to say there is a bittersweet element to this book and I do feel sad as I read on because I know how its all going to turn out. Its a beautifully written book that will keep you up late at night reading. Highly recommended! You know I didn’t like the movie Ground Hog Day either. But this books sounds really interesting. Going to have to put it on my list. Great review! I checked out the preview and I’m definitely going to add this to my list of books to read!